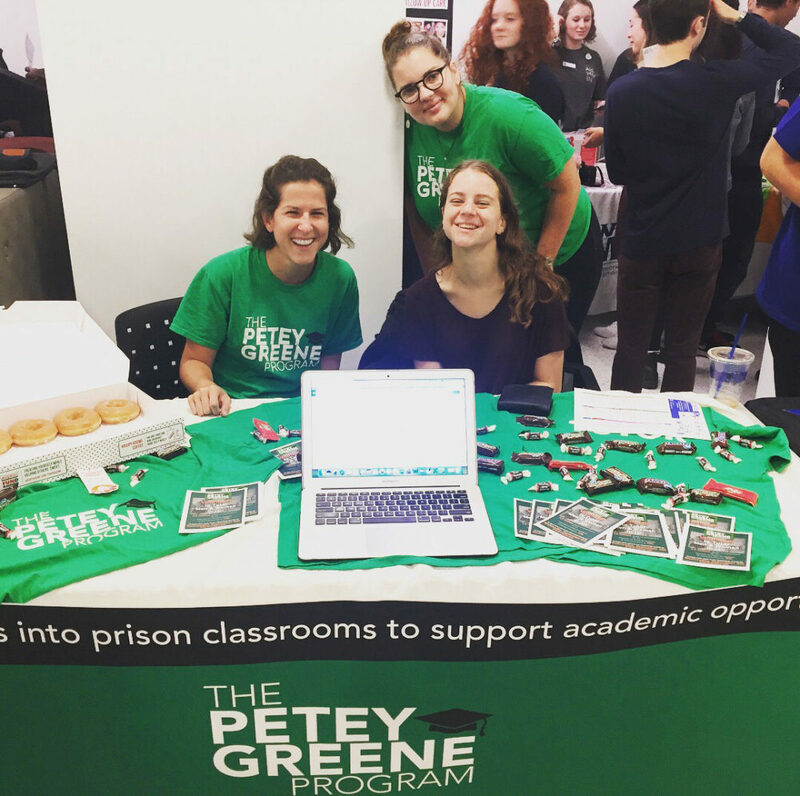 Rachel Knopp and Danielle Makous, tutors for the Petey Greene Program, recruit new members to tutor incarcerated people with the program’s regional director SJ Bashein. Senior Danielle Makous said when she first made the trek out to the Maryland Correctional Institution for Women, she imagined bleak gray walls, concrete and bars on all of the buildings. But instead she found a grassy quad, typical textbooks and students who were eager to learn during their time together – just like her. A vast majority of Americans have no idea what goes on within the walls of the about 5,000 local jails and state and federal prisons across the country, Makous said. But students in GW’s chapter of the Petey Greene Program, which began in 2015 and pairs students at three area colleges with incarcerated people to tutor, visit facilities and provide GED tutoring around Maryland every week. Last spring the group had 25 available tutoring spots, but this fall that number almost quadrupled to 91 spots with 35 of the positions currently filled by GW students. Last academic year, tutors spent 426 hours in tutoring sessions and with increased membership they’ll reach even more incarcerated people this year. Makous, a senior majoring in political communication, said when she joined the program toward the end of her sophomore year she knew the stereotypes of incarcerated people likely weren’t true, but didn’t have any personal experience. Makous added that the differences between her and the students she tutors are only the zip code they grew up in and their socioeconomic class — not anything related to their character. The D.C. and Maryland regional program partners with GW, Howard University and the University of Maryland-College Park to place tutors at six facilities, including the Maryland Correctional Institution for Women and county jails in Anne Arundel and Prince George’s counties, to tutor incarcerated people before their GED test. Bashein said she is licensed to practice social work in D.C. but hadn’t worked with incarcerated people before she started at the Petey Greene Program about a year and a half ago. Through her education, she said she learned that social workers have a duty to serve underserved populations. Bashein said after the tutors complete the mandatory five-part tutor training that she administers, the tutors are ready to go to the facilities and help students complete practice problems for their upcoming GED exams. Depending on the facility, tutors either work with students one-on-one or act as an assistant while a teacher works with a class more formally. Many of the students in the program complete their GED, but seeing the small achievements every day is more beneficial for the student and the tutor, she added. Rachel Knopp, a senior majoring in international affairs, co-founded GW’s chapter of the program when she was a sophomore. While the students are all working toward completing their GED, Knopp said it’s more important for them to create smaller victories – like learning a new concept or mastering a certain type of problem – and to encourage students to keep working hard than to focus on a quick path to passing the exam. “We try to have some sense of accomplishment every time we sit down with them,” Knopp said. William Jacobs-Perez, a junior majoring in political science and criminal justice who started working with Petey Greene last year, said one of the most rewarding parts of his time with the program has been working side-by-side with students.